Perhaps you've seen names like 'The Bible with Strong's Numbers', etc. The fact is that an ordinary person does not know the alphabets of the original languages ​​of the Bible (Hebrew and Ancient Greek), because he can not work with the dictionary. Moreover, to work with the dictionary you need to know the grammar in order to isolate the root and look for it. Strong numbered all the words of the dictionary and so it becomes easy to find the meaning of the required word. Moreover, he wrote a number under each of the words (a translation) and a person can easily find the interpretation of the required word. In addition, the numbers are easier to write down than Hebrew or Greek letters. There is a Russian version of the site. The site of my friend, a talented programmer from Prague. A large number of Bible translations, including Russian ones. And there are translations with Strong's numbers. Bible with translation into Greek and Hebrew. The text of the Bible with a translation, parallel text. More than 20 versions of the Bible in Russian and other languages. 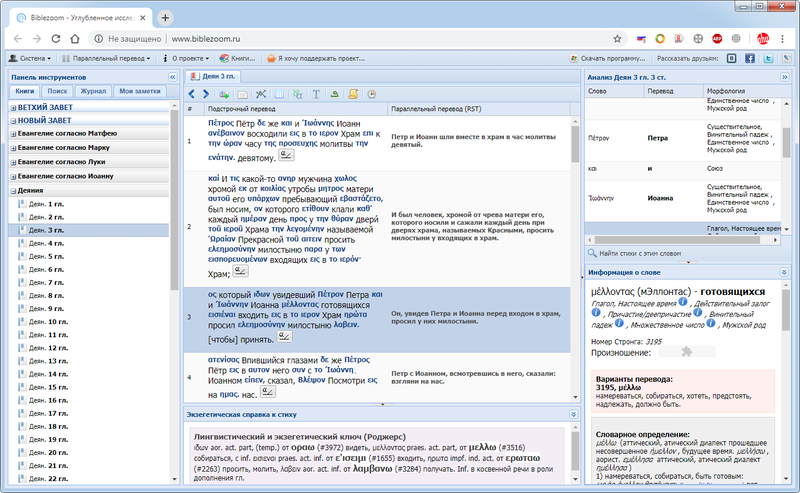 Get information about every Greek or Hebrew word, namely: writing, morphology, phonetic transcription, audio sounding of the root word, possible translation options, dictionary definition from the Greek-Russian symphony. Interlinear translation of the New Testament into Russian Vinokurov Alexei. The text of the 3rd edition of the Greek New Testament of the United Bible Societies is taken as the original. Symphony of Greek Dictionary Forms. Symphony of James Strong's numbers. Audio recordings of the pronunciation of Hebrew and Greek words. JS Framework Sencha distributed by GNU. Click the verse and the The layout of all the words of the verse, click on any and get a more detailed interpretation, some have even an audio file to listen to the pronunciation. The site is made on Ajax, because everything happens quickly and pleasantly. Site without ads, the whole space Is busy solely with the case. You can place a link to any place in the New Testament. The program has an offline version, under Windows. It costs 900 rubles. All subsequent updates are free. The ability to add modules from Quotes from the Bible. When you purchase a program, you get a free application for Adroid or iPhone. This Bible has several translations, including Russian, Chinese and the original languages. 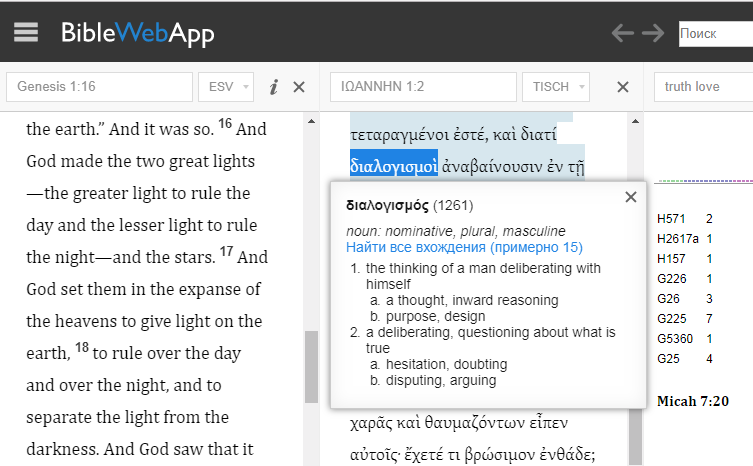 The ability to view 2 translations in parallel. By default, the translations are in Greek and English (King James Version). We put one word in one translation and it stands out in the other. Such a link is not in all translations. You can highlight only verbs or nouns (it's clear in the original) and if you click on the word, the translation is displayed. If you use the left window, then both windows will be synchronized. If it's right, you can watch it separately.